The leader of the Celtic folk quartet Blackwaterside has come to master all varieties of the flute. But if not for her mother’s love of tea, Susan Craig Winsberg would never have been introduced to the exotic sounding instrument at all. 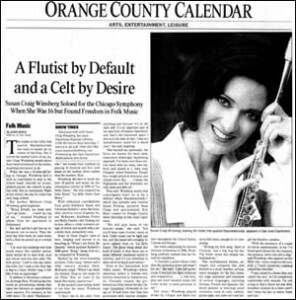 When she was a 10-year-old living in Chicago, Winsberg had to pick an instrument to play in the school band. Already an accomplished pianist, she wanted to play the cello. But on Instrument Night at her school, the line for cellos was very long, indeed. Her mother, Millicent Craig Winsberg, grew impatient. “Being British, my mom said, ‘Let’s go home . . . I need my cup of tea,'” recalled Winsberg by phone from her apartment in Hollywood. In addition to becoming a virtuoso on all things flute, Winsberg has fostered an adventurous streak that takes herself and listeners on unpredictable sojourns. For instance, on her 1995 debut CD titled “Blackwaterside,” she breaks from tradition by playing 10 Scottish and five Irish songs on the modern silver – rather than the wooden – flute. Winsberg decided to mesh her love of poetry and music on her subsequent release in 1999 of “La Belle Dame,” the title inspired by John Keats’s “La Belle Dame Sans Merci.” With additional contributions from poets Kathleen Raine and Christina Rossetti–plus the beautiful, emotive voices of guests Susan McKeown, Kathleen Fisher and Molly Pasutti–the 12-song collection offers a richly-textured collage of words and sounds with a decidedly dark, melancholy tone.